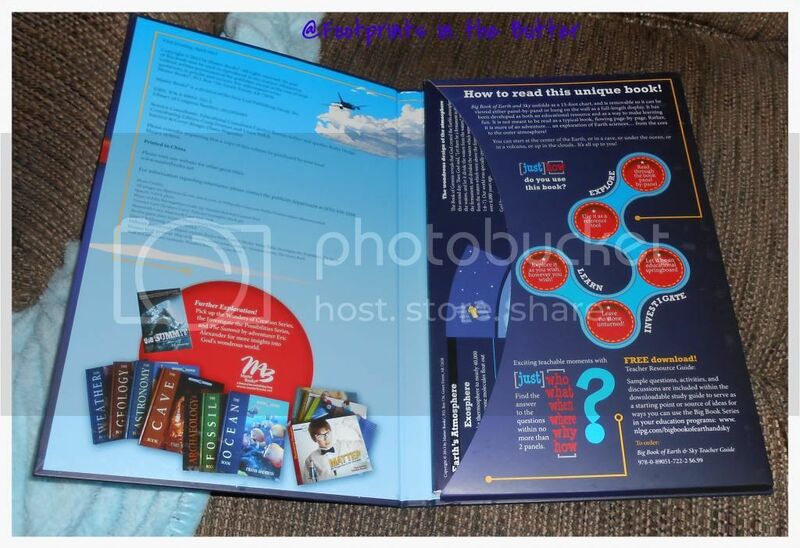 There is a new program coming to the homeschooling world here in the next week or so, and I get a chance to review it! This here isn't that review... but in advance of its release, I have had a chance to look at a pre-final version of the program, and a chance to give one of YOU a digital copy of this product. The review will be coming in August, after we have had a chance to actually work with the final version of the program. 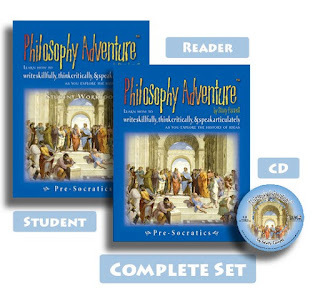 Philosophy Adventure™ is a program designed to help students 6th-12th grade cultivate and defend a biblical worldview by teaching them how to write skillfully, think critically, and speak articulately as they explore the history of philosophy. Okay, that all sounds good to me! And I have three students in grades 6-12 (actually, they are in grades 7-11 now, how did THAT happen?) so I certainly have some test subjects. 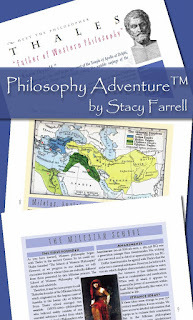 The complete set consists of three parts: a Reader, which is the basic text for the program; a Student text, which contains notebook pages for each philosopher, mapping assignments, writing assignments, and more; and a teacher's resource section, which contains some teaching help, answer keys, timelines and flashcards. I've had the Reader for a week or so, and have had a chance to start reading through that. Fabulous information, and clearly Stacy Farrell has spent considerable time putting together fascinating information in an easy-to-digest format. From glancing through the Student Workbook and the Teacher's Resources, I'm even more excited to start using this. The mapping assignments are straightforward enough that even I can see using them, and the timelines are very appealing. There are a few ideas for scheduling the material. Basically, there are eight different philosophers to study, with a unit devoted to each. You could do a unit per week (there is a sample schedule available for that) and finish in about two months. You could spread a unit out over a month to make this a year-long course. What we are planning, though, is to take the middle ground by completing each unit in two weeks. I think that workload is going to be about perfect. By the time I'm due to write this review in August, I'm hoping we'll be through three or four of the units (having to take some time off when kids are off at camp!) so I should be able to give a pretty decent review at that point. The prices are reasonable too. A complete physical set is available for $89.95. What I have (and am giving away) is a complete download version, which is available for $39.95. There are other options that include some physical and some digital products at price points in between. Now, a giveaway! This will stay open for a week, and it is for a digital version of the Philosophy Adventure -- Pre-Socratics program. We've been traveling since I last posted, driving 1000 miles to North Dakota and hanging out there. The extent of reading aloud there was a couple days of The American Patriot's Almanac by William Bennett. And a chapter of something else. Unfortunately, all the books on tape (yes, real cassette tapes) and the playaway books (to be listened to using one of those little cassette converter things) are just taking up space in the van. The tape deck doesn't work. So we were limited to listening to the radio on our drive. Late last week, we drove to Minneapolis. The extent of the reading aloud here has been, well, ummm... nothing. However, unlike my last post (a confession edition), I'm not feeling guilty about this at all. I think it is a good thing to have some time off too. I'm feeling incredibly motivated at this point about getting home and taking the read-alouds seriously. I'm excited about the possibilities. Do we get back to Lord of the Rings? Do we start something else entirely? Do we grab one of the bazillion lists out there right now and choose something that looks interesting? And which type of list do we go with? I'm leaning a bit towards something that is dominated by fun books, not filled up with all kinds of heavy-looking classics. Or maybe we do one of each. A couple weeks without even trying to read aloud has done wonders for my attitude. I'm late. 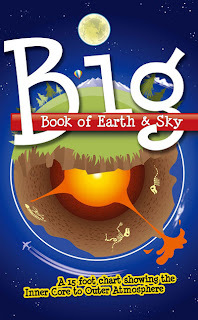 I was supposed to be reviewing this book -- Big Book of Earth & Sky -- last week, but I just had to get photos of it, and with all my travels (we are in Minneapolis, at my mother-in-law's house now!) it just didn't happen. So first things first: There is a Facebook party happening Tuesday, May 28, at 8:00 p.m. CDT. Since I'm in Central Time at the moment, I'll leave it that way. <grin> You could win cool prizes... like this fantastic book. This is going to be my "a picture is worth 1000 words" review. So be ready. 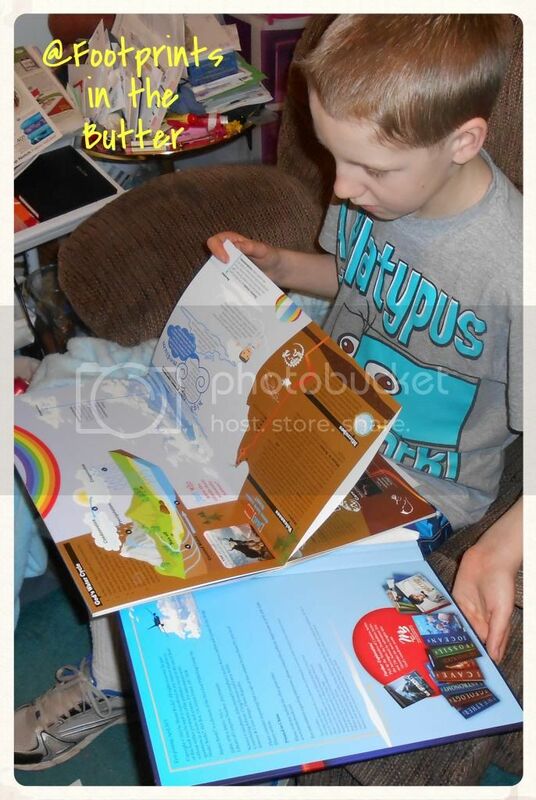 Here is Thomas with the insert part pulled out, and he is flipping through the sections, reading it as much like a book as you can. Right here is the best place to say... the information in this 15-foot chart is great. The illustrations really tell you a lot, so even just looking at the pictures is educational. The text includes a lot of scientific terminology, but it isn't overwhelming. You can see that the text is in nice little "chunks" so that you don't get too much in one place, and the artwork really helps explain. Connor is awfully close to 6' tall now, and even holding it up like this, you are seeing a tiny part of it. What you can see, though, is that the chart goes from the exosphere (which ends 40,000 miles above the surface of the earth) and the rest of the atmosphere, down to the tallest mountains (those are at about Connor's chest in the picture), then it gets into cloud types, mountain zones, precipitation and the like. Around Connor's knees, we learn about the water cycle and volcanoes. Right around floor level, we cover caves and then go underwater. That's only about half the chart. 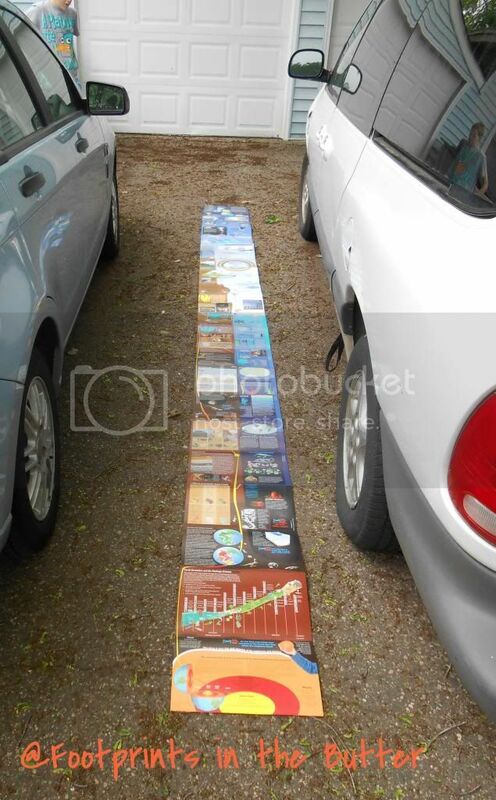 ...laid it out in the driveway. As you can see, it is basically the length of the van. Did I mention this thing is huge? That bottom half, starting with the panel closest to us, down at the bottom, talks about the core of the earth. 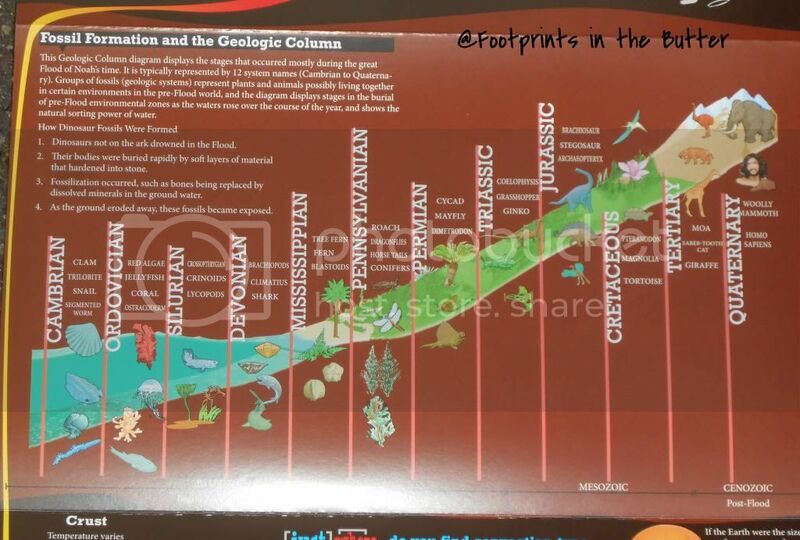 Above that is information on fossils and the geologic column. There is a panel on the continents, and on Pangaea. There is all kinds of stuff on rocks and crystals, and then on erosion. Then we are back up to the caves. There is also a Teacher's Guide, which is available as a free download, or you can purchase a physical copy, that helps organize the use of this book. The first section is called "Intro to Speleology" and it includes all kinds of great vocabulary about caves and then ten great suggestions of "Cave Activities" that you can do. 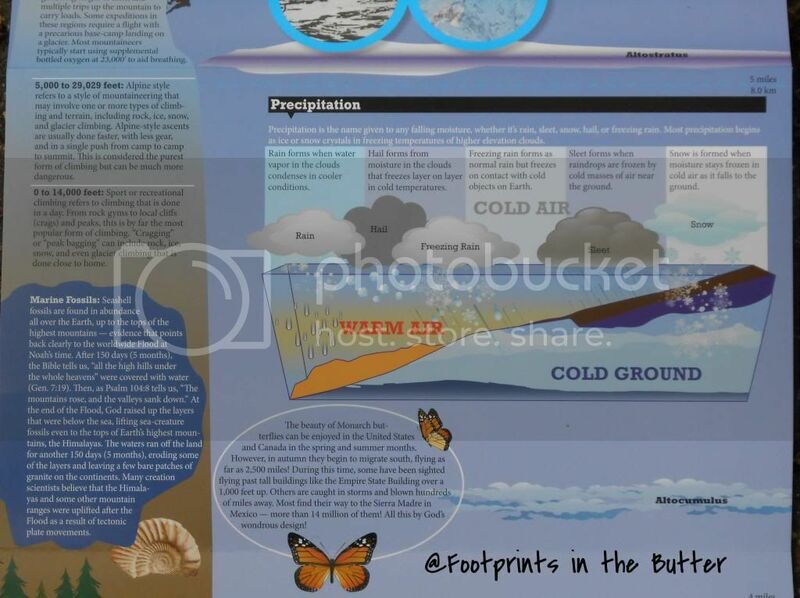 There are similar sections for introducing oceanography, meteorology, and paleontology. After that, there are sections with quizzes and handouts, and some other helpful information too. You can see there is a fair amount of detail there! One thing I especially love is that this is coming from a Creationist perspective, but it doesn't pound you over the head with that. Great resource, and one I am thrilled to own. It will get a lot of use here! You can go see what other Moms of Master Books have to say about Big Book of Earth & Sky! There is a Facebook party coming up on May 28 (Tuesday) at 8 pm CDT where you could win cool prizes including (I assume) this title, among other things, and discuss these books. There is a yummy prize, and a gift certificate too. My son is a huge fan of C. S. Lewis, and of Screwtape Letters. 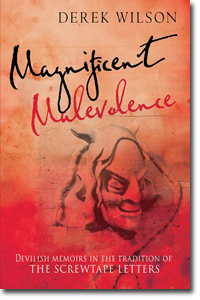 So when I heard about Magnificent Malevolence, by Derek Wilson, of course we had to review it. C. S. Lewis, who introduced Screwtape, a senior devil, to the world in 1942, knew that evil is powerful and personal. He understood that its main thrust was against God and the people of God. There can be no doubt that Lewis would agree that Screwtape and his diabolical colleagues have not ceased their operations in the last seventy years. As the human decades have passed, the same war has been fought, with new weapons and different battle tactics. How fortunate, then, that the following account, rescued from the archives of the Low Command’s Ministry of Misinformation, has fallen into our hands. This remarkable manuscript outlines the career of the prominent devil, Crumblewit SOD (Order of the Sons of Darkness, 1st Class). It was in a much mutilated state and has only, with difficulty, been cut and pasted together to make a reasonably coherent narrative of the activities of a post-Screwtape generation of devils. It is not, of course, "true" in the sense of being an objective appraisal of the struggles between good and evil which dominated human affairs in the period from 1950 to 2000. The account is distorted by Crumblewit’s truly diabolical conceit and also his ability for self-delusion. However, it does shed fresh light on the ups and down experienced by the church throughout this period. Crumblewit's energies were entirely deployed in the religious arena. He was employed exclusively in undermining the attempts of Christians to bring to bear upon world events the prerogatives of love, peace, and justice and to carry out the mission entrusted to them by Jesus . . .
Our take: We both enjoyed this book. It isn't written in the same style as Screwtape Letters, as this is more like a diary by Crumblewit, so the flavor is a bit different. Plus, this follows Crumblewit over his entire career, so he is working with a variety of people. Connor's opinion was that this was a good story, and it did make him think a bit, but he didn't feel like he came away from it with any new insights into how he ought to behave, or how he ought to live differently. For me, having lived through over half of the time period covered in Crumblewit's tenure, I guess I found more that spoke to me. Reminders about some of the sweeping changes I have witnessed in my lifetime, and a glimpse of the evil -- and the good -- in some of the newer technologies, for instance. Today! 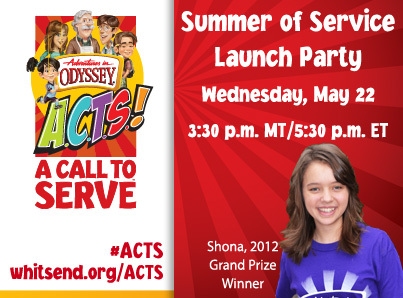 Today there is a webcast happening, sponsored by Adventures in Odyssey and Tyndale Publishing. So if you are reading this reasonably soon after I get this posted, check out that information first... the webcast happens at 3:30 in my world (Mountain Time). Did I mention serving others? 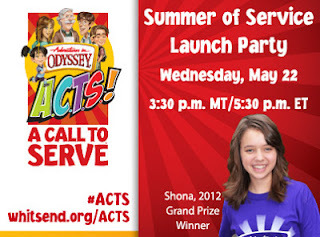 Discover how much fun service can be with Adventures in Odyssey’s A.C.T.S. challenge and contest!